Bill Douglas 's reputation as a film director rests largely on three films he made in the 1970s, the total running length of which is only just over three hours. My Childhood (1972), My Ain Folk (1973) and My Way Home (1978) provide a painfully intense picture of a harsh upbringing marked by poverty, isolation and the complex family background of a boy who only gradually discovers that his father is the man who lives down the road and that his mother is in an asylum. All three films were closely modelled on the director's own experiences and memories. They were largely filmed in Newcraighall, the mining village on the outskirts of Edinburgh where Douglas was born on 17 April 1934, and where he spent his childhood. Fiercely unsentimental, often bleak, and making sparse use of dialogue and camera movement, the films also include moments of exhilaration. One such moment occurs at the beginning of My Ain Folk , when a visit to the cinema allows a brief splash of Technicolor, differing sharply from the otherwise dominant grainy black-and-white. Here also Douglas was drawing upon his own childhood memories. He later described the cinema as "my real home", writing (in Palace of Dreams) of the magical contrast it offered to the outside world where "whether in the village or the city, whether I was seven or seventeen, it always seemed to be raining or grey." In 1955, while doing his National Service in Egypt, Douglas met a fellow film enthusiast, Peter Jewell , who was to remain a friend and key support for the rest of his life. After a period of work as an actor for Joan Littlewood 's Theatre Workshop and as one of the cast of Granada Television 's Younger Generation series (1961), Douglas enrolled at the London Film School in 1969. The short films he made as a student included Come Dancing , which was screened at the National Film Theatre in 1970. His script for what would eventually become My Childhood was rejected by Films of Scotland on the grounds that it failed to project Scotland as a forward-looking nation, but the project was taken up by Mamoun Hassan , recently appointed head of production at the British Film Institute . My Childhood was shot on 16mm, with a cast of non-professionals and a budget of £3,500. Set at the end of the Second World War, it takes the story of Jamie ( Stephen Archibald , who was to play the character in all three films) up to the death of his maternal grandmother. While firmly based in the locality, it was not a film that fitted neatly into a Scottish or British tradition of film-making. Key inspirations were Soviet montage, silent cinema and the European art film. On its release in 1972 it was greeted with some local dismay, but went on to gather high critical praise and a series of awards at festivals from Venice to Tehran . The following year the story was continued in My Ain Folk , after which there was a longer gap before the appearance of My Way Home , which took Jamie from a welfare institution in Edinburgh to National Service in Egypt. The second and third films in the trilogy were slightly longer than the 48 minute My Childhood , and made with larger, though still very small budgets (little more than £12,000 and £33,000 respectively). All three films were made in trying circumstances. By all accounts (including his own) Douglas ' perfectionism meant he could be a difficult person to work with and his relationship with the BFI grew increasingly fraught. Despite the critical success gained by the films, by the 1980s he found himself out of step with the turn towards formal experimentation that the BFI Production Board was taking. Difficulties in raising finance for a further project led him to teaching, first at the National Film and Television School , then at Strathclyde University . Eventually he managed to find backing from Skreba Films , the National Film Finance Corporation , Channel Four and Curzon Film Distributors for a film about the Dorset farm labourers who in 1834 were deported for forming a trade union. This marked a break from his previous work in several respects. 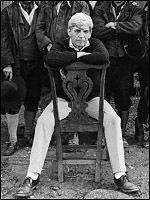 Shot in colour, in both England and Australia, with a cast that included established actors such as Robert Stephens and Vanessa Redgrave , the three hour film was a move away from the intimate, autobiographical concerns of the Trilogy, and a shift in its concern with collective action rather than individual isolation. Going under the full title of Comrades: A Lanternist's Account of the Tolpuddle Martyrs and What Became of Them , the film allowed Douglas to use his fascination with early optical entertainments to highlight the role of images and illusion in the telling of history. Eight years after the project had been initiated, Comrades was eventually released in 1987, receiving generally sympathetic reviews, but only limited distribution. Douglas continued to work on other projects, including a film based on the life of cinema pioneer Eadweard Muybridge and a version of James Hogg 's Confessions of a Justified Sinner, but Comrades was to be his final film. He died of cancer on 18 June 1991, aged 54. He left behind his collection of cinematic and pre-cinematic artefacts (now held at The Bill Douglas Centre for the History of Cinema and Popular Culture at Exeter University ) and a body of work that was hardly extensive, but contains moments as intense and lyrical as any in British film history.